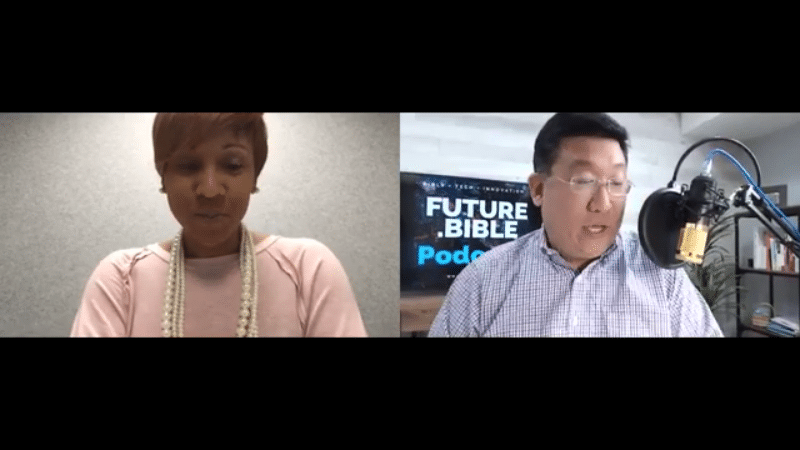 Kenny Jahng: Hey friends, welcome back to the future.bible podcast. My name is Kenny Jang, co-host and you realized that today, DJ Chuang, my partner in crime is not here today, but that’s okay because we’ve got someone on the other side of the interwebs that’s just as exciting. Nona Jones is here with us. Welcome to the show today. Kenny Jahng: Thanks so much for checking in with us. First of all, Nona, where in the world are you today? You’re traveling the globe trotter. You remember like, where in the world is Carmen, San Diego? We almost need a new game put out. Nona Jones: I’m actually at our headquarters at Facebook headquarters in Menlo Park, California right now. So I’m getting ready to fly over to Anaheim, I think tomorrow for the NRB Summit. Kenny Jahng: Nice. Awesome. And so that’s one of the things that we want to talk about today. But first, for some of the people here that are being exposed to you for the first time, can you just share a little bit about what your role is? It’s really exciting and unique or refreshing to a lot of people when they hear what you’re in charged or tasked with at Facebook? Nona Jones: Oh yeah, sure. So I get to lead our faith-based partnerships org, which means I get to work with, you know, pastors and denominations, churches just all over the world, all around the globe to help them optimize Facebook as a community building platform as opposed to the traditional use of Facebook that has always been a content distribution channel. But, with the change in our mission, it really is all about community. So, that’s what I get to do every day. Kenny Jahng: Nice. And so when you’re looking at the faith-based landscape and the partners and the organizations that you are working with, what’s the number one pain point that you’re seeing? From my side, what I hear a lot about is they feel like they’re on this treadmill of death. They have to have content going to constantly, every single day. They got to tend to it every single day. It’s almost like endless. Is that something that you’re hearing? Are you hearing something different from the people that you’re working with? Nona Jones: I definitely do hear that. I think the thing that I’ve heard the most over the last probably 8-10 months has really been a lot of heartburn around our algorithm change that has caused some challenges around content distribution. So, the number of people who are actually seeing posts, liking posts, maybe being able to watch the livestream, there’s been a noticeable drop in that and I think that has caused a lot of churn because most organizations have, again, as I said earlier, use Facebook primarily as a content distribution channels. Now, that the algorithm has changed, it’s really caused a lot of consternation on people. But, that’s part of the reason why, frankly, I’m so excited about the job I get to do because I get to teach people, well, here’s how you actually can use Facebook to your advantage. And also, do that in alignment with the algorithm. Kenny Jahng: Now, I’ve always said — and tell me if I’m wrong — is that churches and faith-based communities are set up for success when they’re trying to use Facebook because they are communities. They are ecosystems. They are families. They are congregations. They have these dynamics. And I think actually mark went around touring some churches at some point looking at the model, the churches where it’s small group, large group, all these mixed type of interactions. And the church committee already has that stuff offline. And I think it’s about teaching these practitioners in the church communication space to say, “Hey, how do we translate that into a digital context?” And so do you agree with that? What do you think of that when I say that the church and these faith based organizations are set up for success in essence because that’s who they are in the DNA perspective. Nona Jones: Absolutely. Yeah. I think something that’s a very big value that church communities in particular have is, you know, when you think about the great commission and the call to evangelism, the call to make disciples, that’s very unique because most faiths traditions actually don’t have an evangelistic call. It’s basically an individual experience. And so, I think what churches have done really well is focused on building communities and also focused on growing those communities through discipleship. Now, where churches have been challenged when it comes to social media is that I think there continues to be a view of social media the same way you would view broadcast media and broadcast is very much so unit directional. It’s kind of like, here’s my message, I’m throwing it out to you to receive it. But social media, the first word in that phrase is social. It’s really meant to be conversational. It’s meant to actually drive connections and relationships. And so, you know, as we think about the new mission of our company being, you know, give people the power to build community, what we’re really doing in a faith based context is trying to equip people to do discipleship digitally. That’s what beauty is. And I think there’s a misunderstanding. Sometimes church has been reduced down to a program. You know, something you go do at a place and had a time when in fact, the church is the living, breathing body of believers, who view Jesus as Lord of their life. And so it’s a community. That’s what the church is. So, I feel like this change is all about really returning to a biblical model of ministry. Kenny Jahng: Yeah. So, let’s talk about that. I think one of this algorithm change and from the partners and organizations that my consultancy actually working with, one of the things that we see that is working is once we get out of that confusion that your goal is not just to amass likes and reach, but actually to build relationships, then things turn on and your group just comes alive. I’m part of one group that has over 19,000 people in it and it is one of the most vibrant groups that I’m part of. A smaller group that has a couple of dozen people and same thing. People are helping each other in a much more generous posture than you might think offline. And once you unlock that, things change. It’s a game changer, right? So maybe if you can help us a little bit, set that, frame it for us of what is community on Facebook look like? What’s the ideal scenario? Is there certain first steps that people can take to actually reframe their thinking from reach to relationship? Nona Jones: Sure. Well, let me first kind of demystify the algorithm. You know, for the first 10 years of our existence, the mission of our company was to make the world more open and connected. And that’s why, you know, if you had a page, you would see a lot of response to posts that were made because the way the algorithm treated that content was pretty favorably. But then, we started to get some complaints from people who said, you know, I really don’t want to see all this page content in my newsfeed. I really want to see content from friends and family and the units I care about. And so when the algorithm has changed, what we really did is we prioritized Facebook groups as our community building platform by the lights just went off in this room. I don’t know why, but we prioritize groups as our community building platform. And so now, the distribution of content from groups is ranked almost as highly as friends and family. And so, people are way more likely to see what’s posted in your church group, for example, than on your church page. And the reason for that is this. So, if you think about your Facebook presence, like a house per page as your front porch, this is the metaphor I always like to use is your front porch. People don’t tend to congregate on portraits, right? They just kind of go transact business. Maybe they have a package to drop off. Maybe, they need to ask a question. But, your group is like your living room. So, it’s the place that people can kind of come inside and you feel good. You can get to know each other, they can get to know you. You can actually have a conversation. There’s a reason why small groups don’t happen on porches. They happen in living rooms. That’s where community happens. So, that really is how we’re treating community. And, we’re seeing a whole lot of, your point, a whole lot of success through that platform. Kenny Jahng: Now, I think it really is also that mindset. I’ve put down the megaphone, pick up the telephone, don’t just post stuff and walk away. You have to be responding. And one of the things that I’ve heard recently from some brand managers as they say, they don’t respond because then it’s this like deep dive black hole where they’ll never come out again. What do you say to that? Don’t you think? I personally think you have to have group managers that are interactive. Nona Jones: Absolutely. If somebody came to your physical location, you would probably have some greeters, you would probably have people on hand, to make the people feel welcome and to make them feel like they belong. And that’s the whole point of having a team of people to help lead a community. It’s to help people integrate into the culture of that even digital community and make them feel welcome and like they belong. Kenny Jahng: I’m going to shift the focus a little bit because Facebook also owns Instagram. Which is another competing platform that social media managers and communicators have to think about. How do you respond to that? How are you supposed to use both in terms of reaching your audience and building that community? Nona Jones: Well, Instagram is definitely a visual platform, so it’s all about the graphics, the photos. One thing I like to tell people is think of it truly as a visual first. It’s not text first, right? A lot of people use Instagram with a whole lot of text. And so, that doesn’t drive engagement. Now, Instagram isn’t as much of a community building platform because it still is very much so unidirectional somebody posts content and people respond to the content, they’re not necessarily responding to one another. Right? Whereas for groups on Facebook, that’s really the goal is for people to not only respond to the content, but then they can also respond to each other. So, that’s the nuance. Both platforms play a very important role. They’re part of our family of apps and so they both have a community mission. But again, the groups platform is totally intended for community. Kenny Jahng: Now. Are there any resources that you could point people to in terms of getting some skills of how to, you know, the best practices for managing groups, getting people into groups, et cetera. I know there’s Facebook blueprints, which I point a lot of people too. Are there any other resources that you might think of? Nona Jones: Yes. So Facebook blueprint is great. We also have a website and I was looking it up now just to make sure that I have the website correct. Nona Jones: You will get a education on how to use groups as a community building platform. Kenny Jahng: Well, thank you so much for those tips in that direction of where we should be headed. If someone say was really leaning forward and wants to get in touch with you directly, what’s the best way that they can do that after today’s interview? Nona Jones: Sure. So they can reach me at nonajones.com. That’s the best way to reach me. And you can also learn more about Facebook groups and community facebook.com/community. Kenny Jahng: Okay. facebook.com/community. Lastly, you’re gonna be speaking of NRB, the digital media summit this Friday. We really look forward to meeting you there. and hopefully we’ll get a chance to visit with you after the summit at some point. Nona Jones: That sounds great. I am looking forward to it. Kenny Jahng: Thanks again, Nona. And the listeners here, thank you so much for being a part of today’s show. Please drop us a note on our website, future.bible. Let us know what other questions you have for Facebook, Nona and others, and we’ll be sure to wrap up another secondary episode with her sometime in the near future. Thanks so much for listening. Remember, be social, stay social. Churches and faith-based communities are set up for success when they’re trying to use Facebook because they are communities. I think what churches have done really well is focused on building communities and also focused on growing those communities through discipleship. Now, where churches have been challenged when it comes to social media is that I think there continues to be a view of social media the same way you would view broadcast media and broadcast is very much so unit directional. It’s kind of like, here’s my message, I’m throwing it out to you to receive it. But social media, the first word in that phrase is social. It’s really meant to be conversational. It’s meant to actually drive connections and relationships. What we’re really doing in a faith based context is trying to equip people to do discipleship digitally. One of the things that we see that is working is once we get out of that confusion that your goal is not just to amass likes and reach, but actually to build relationships, then things turn on and your group just comes alive. And so when the algorithm has changed, what we really did is we prioritized Facebook groups as our community building platform by the lights just went off in this room. I don’t know why, but we prioritize groups as our community building platform. And so now, the distribution of content from groups is ranked almost as highly as friends and family. And so, people are way more likely to see what’s posted in your church group, for example, than on your church page. There’s a reason why small groups don’t happen on porches. They happen in living rooms. That’s where community happens. So, that really is how we’re treating community. That’s the whole point of having a team of people to help lead a community. It’s to help people integrate into the culture of that even digital community and make them feel welcome and like they belong. Instagram is definitely a visual platform, so it’s all about the graphics, the photos. One thing I like to tell people is think of it truly as a visual first. It’s not text first.